Poverty can have a corrosive influence on the human spirit. 貧しさは人間の精神をむしばむ(力をもつ)ことがある. She has a corrosive tongue. 彼女はしんらつな口をきく. 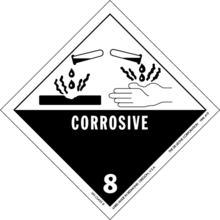 Warning symbol for corrosive substances. Eating away; having the power of gradually wearing, hanging, or destroying the texture or substance of a body; as the corrosive action of an acid. Having the quality of fretting or vexing. Care is no cure, but corrosive. That which has the quality of eating or wearing away gradually. Any solid, liquid or gas capable of irreparably harming living tissues or damaging material on contact.